I think this is hilarious. The idea: on May 15th, 2008, everyone around the globe needs to go out to their local chain grocery store and buy as many carrots as possible. The rationale: No one really knows, but it would be kind of funny to see a story on the news about a world-wide carrot shortage. I'm almost tempted to buy-in. I'll just make a lot of carrot soup that week, I guess... You can join a group on Facebook of folks planning on joining this endeavor. Check it out. While stumbling around the internet this evening, I came across this site: www.sendmepennies.com. The premise: A guy has a dream: to walk into a bank or a store and purchase something for $10,000 with pennies. That's a lot of pennies. That's 1,000,000 pennies. One Million. But he doesn't want to use all of his own pennies - so he starts a website and asks people to give him a penny. Just one penny. More, if you like, but all he's asking for is one penny, via Paypal or snailmail. The progress: So far, he's collected 97,167 pennies. While that's not a million, it's a lot of pennies. sounds like a spam to me. you have no address,phone no. or charity id #. i have contacted the FBI to see if you are legal. Mmhmm... First of all, that would be a "scam", not a "spam". Second of all, he's very forthright - he wants people to send him money, so that he can buy something. He's not claiming he'll give it away to charity. He's not telling people they're buying anything by giving him money. People leave comments talking about the starving children in Africa and the lost and abandoned children, they talk about money that should go to the families of dead soldiers... While they are all worthy causes, what is a penny worth to us? Personally, I hate pennies. When I'm vacuuming the stairs and I find a penny, I try to vacuum it up or I toss it in the garbage. So why not just toss it in an envelope and send it out to this guy who has a fun idea? There once was a time when I was in elementary school when projects like this were encouraged - writing companies for free things, starting chain letters asking for other letters or for stamps or for something else worth collecting... What's wrong with a project like this? I think it's fun. Check out the website, it's kind of a fun adventure. Last week I came home from work and Brian suggested to me that we go to the mall. That's weird. If you know him, you'll know how weird that is. Then he pulled out three gift cards from Sears with different amounts written on the back - obviously from our wedding, since we don't tend to get gift cards a lot. We weren't sure whether there actually was any money left on the cards but thought, what the heck, let's go see if there's anything on them, and buy ourselves some new pots and pans! Sure enough, when we got to the story the customer service representative confirmed that the amounts on the back of the cards were indeed correct. How exciting! We raced over to the Kitchen Wares section and started looking, lifting and comparing different sets and brands. We finally found a small set that Brian was comfortable with but I wasn't sure - it was the Kennmore brand so chances were we wouldn't be able to find any supplemental pieces if we wanted - like a double broiler, etc. I wanted to think about it a bit, so we wandered around and, as I tend to do, I wandered right into the clearance section. 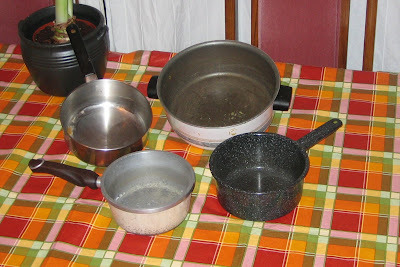 I saw a big box on the floor and started rifling through it - a set of pots and pans, ridiculously cheap! But they were ugly. Very ugly. So I kept looking. Shortly thereafter I came upon a Kitchenaid box - and was delighted with the contents. 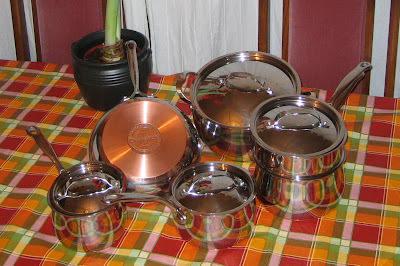 Brian came along, and we agreed that yes, this is the set for us - a 10 piece, copper bottomed set of Gourment Chef KitchenAid pots and pans! As we packed the box back up with our find, a man with what seemed to be good intentions came by and told us that he had bought that same set in the summer and you know what? It's sitting in his closet in the box. He packed it right back up after his food kept sticking to the frying pan. They say it's stainless steel, but everything sticks. Now you know where to find a good set of pots and pans? I'll tell you. Ikea. Nothin' sticks to them, and they cost $10/piece. We thanked him for his editorial and hurried with our find to the cash register. Weirder yet - Brian wanted to stay at the mall and walk around for a while. And for those of you who bought us gifts for our wedding, we are very very thankful for the gifts and the ThankYou Cards are still coming... It still counts if it's a year and a half late, doesn't it?